A singing plant. A daring hero. A sweet girl. A demented dentist. 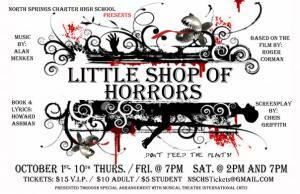 Come see NSCHS's fall production, Little Shop of Horrors. Stuck in a dead-end existence on Skid Row, Seymour Krellborn discovers a strange and interesting new plant, who soon begins to sing for his supper. send an email to NSCHStickets@gmail.com for access to the online reservation system.